Soil organic matter (SOM) contains C compounds with different levels of degradability, from very easily decomposable to extremely resistant (recalcitrant) to decomposition. Each C component has a different residence time in the soil and performs different functions. Reactive carbon (RC), also known as permanganate oxidizable carbon (POxC), is a fraction of the SOM pool that is oxidizable in the presence of potassium permanganate in solution. Carbon oxidized by this compound includes the C most readily degradable by microorganisms as well as that bound to soil minerals, making RC interpretation somewhat difficult. Because of this association to the mineral fraction, RC is considered a chemical indicator, not a biological indicator. Nevertheless, a recent research project conducted across a range of environments and management conditions (12 studies) showed that POxC was significantly related to particulate organic carbon, soil microbial biomass carbon (BMC), and, in one study, soil organic carbon. The residence time of RC is estimated to be 2 to 5 years, in contrast to recalcitrant C (e.g., humus) that has a turnover time of several hundred to thousands of years. Reactive carbon originates from the various fractions of SOM. These fractions include fresh organic material, soil microbial biomass, particulate organic matter, and other easily metabolized organic compounds, such as carbohydrates (sugars) and proteins (amino acids), as well as C loosely bound to soil minerals. Because of its relatively short turnover time, RC is more sensitive to management changes affecting soil C in agro-ecosystems than total organic carbon (TOC). Reactive carbon may be used as an indicator of change produced by cropping and soil management practices that manipulate SOM content. It is well documented that many soil functions are strongly influenced by SOM and, due to its association with TOC and microbial biomass, are likely to be related to RC as well. However, as the exact nature of the C fraction extracted by the potassium permanganate oxidation method has not been fully characterized, the functions affected must be addressed in general terms. Enhanced water aggregate stability by high levels of SOM (and, concomitantly, high levels of RC) improves water infiltration, reducing soil degradation by water and wind erosion. Reactive carbon is linked to a number of soil processes, including microbial biomass growth/activity and nutrient cycling. Researchers have found that POxC is significantly related to MBC and in few cases SOC and, thus, may be equally well suited to track management practices that promote C sequestration. Due to the relatively short turnover time of RC, significant decreases in RC may signal a decline in SOM and indicate the deterioration of physical, chemical, and biological properties and processes related to SOM. The adverse effects caused by the decline in RC include reduced aggregate stability, increased bulk density, and reduced water infiltration, water-holding capacity, microbial activity, and nutrient availability. +) and anions (SO4 2-, Cl-, NO3 -, and HCO3 -) from salts dissolved in soil water carry electrical charges and conduct the electrical current. Consequently, the concentration of ions determines the EC of soils. 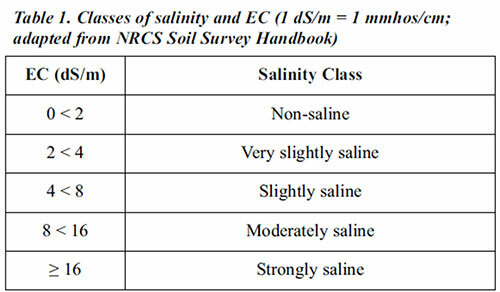 In agriculture, EC has been used principally as a measure of soil salinity (table 1); however, in non-saline soils, EC can be an estimate of other soil properties, such as soil moisture and soil depth. EC is expressed in deciSiemens per meter (dS/m). Soil EC does not directly affect plant growth but has been used as an indirect indicator of the amount of nutrients available for plant uptake and salinity levels. EC has been used as a surrogate measure of salt concentration, organic matter, cation-exchange capacity, soil texture, soil thickness, nutrients (e.g., nitrate), water-holding capacity, and drainage conditions. In site-specific management and high-intensity soil surveys, EC is used to partition units of management, differentiate soil types, and predict soil fertility and crop yields. For example, farmers can use EC maps to apply different management strategies (e.g., N fertilizers) to sections of a field that have different types of soil. In some management units, high EC has been associated with high levels of nitrate and other selected soil nutrients (P, K, Ca, Mg, Mn, Zn, and Cu). Most microorganisms are sensitive to salt (high EC). Actinomycetes and fungi are less sensitive than bacteria, except for halophyte (salt-tolerant) bacteria. 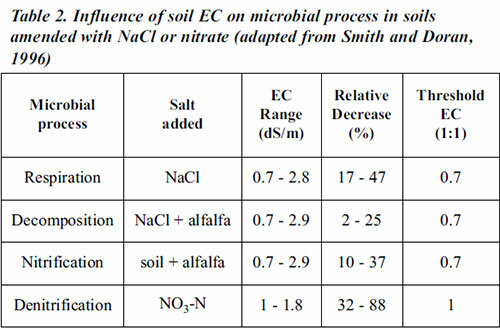 Microbial processes, including respiration and nitrification, decline as EC increases (table 2). 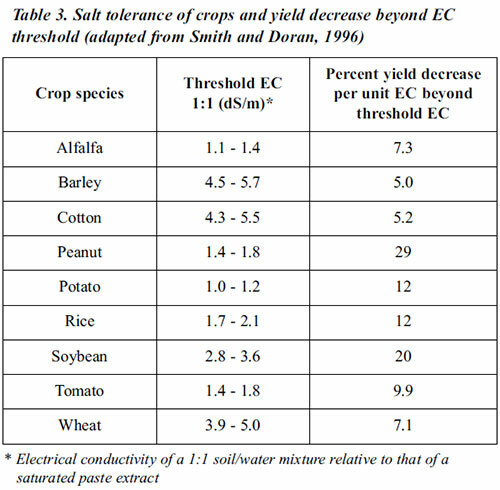 High EC can serve as an indication of salinity (EC > 4 dS/m) problems, which impede crop growth (inability to absorb water even when present) and microbial activity (tables 2 and 3). Soils with high EC resulting from a high concentration of sodium generally have poor structure and drainage, and sodium becomes toxic to plants. Effective irrigation practices, which wash soluble salts out of soil and beyond the rooting depth, can decrease EC. Excessive irrigation and waterlogging should be avoided since a rising water table may bring soluble salts into the root zone. In arid climates, plant residue and mulch help soils to remain wetter and thus allow seasonal precipitation and irrigation to be more effective in leaching salts from the surface. To avoid the adverse effects of high EC (salinity) in irrigation water, the leaching requirement must be calculated for each crop. Leaching requirement is the fraction of water needed to flush excessive salt below the root zone, that is, the amount of additional water required to maintain a target salinity level. Adding organic matter, such as manure and compost, increases EC by adding cations and anions and improving the water-holding capacity. In some cases, a combination of irrigation and drainage is necessary to lower salt concentration and EC. An EC water (ECw) ≤ 0.75 dS/m is considered good for irrigation water. Beyond this value, leaching or a combination of leaching and drainage will be necessary if the water is used. Nitrate (NO3 -) is a form of inorganic nitrogen (N) naturally occurring in soils. Sources of soil NO3 – include decomposing plant residues and animal manure/compost, chemical fertilizers, exudates from living plants, rainfall, and lightning. Eventually, nitrate ions immobilized by microorganisms (nitrate taken up by microorganisms) are converted into organic forms and released back to the soil in plant-available forms when dead soil organisms are fed upon or decompose. In well drained soils, ammonium (NH4 +) and ammonia (NH3) are converted into NO3 by very specific populations of aerobic bacteria. This process is known as nitrification. Another biological N transformation is denitrification, which is the conversion of NO3 – into nitrous oxide (N2O), nitrogen dioxide (NO2), and nitrogen gas (N2) that often occurs in anaerobic soils, such as waterlogged soils and wetlands. Even when nitrifying bacteria are very active in the outer parts of aggregates in well aerated soils, denitrification may still occur in anaerobic microsites inside the aggregates. Nitrate is very soluble in water and can be easily transported by runoff and other surface and subsurface flows to rivers and lakes or moved downward to ground water. The primary function of NO3 – is to serve as a source of nitrogen for the nutrition and growth of plants and soil microorganisms. Denitrification results in nitrogen loss from soil and produces some forms of intermediate gaseous nitrogen (e.g., N2O) that are harmful to the environment. Problems associated with high NO3 – concentration include the pollution of ground water and surface water and an increased risk of eutrophication that threatens the survival of aquatic life. Nitrification can potentially result in soil acidification by hydrogen ions (H+) released during the process. 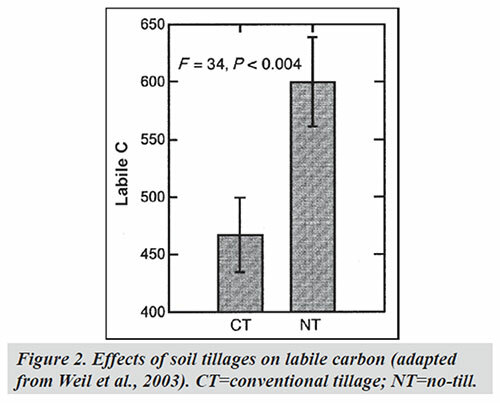 In a study conducted at the University of Maryland Research Center, soil NO3 – concentrations at any depth (except 0-30 cm) have been found to be consistently lower in no-till plots than in conventional-till plots (see Figure 2) and were related to the amount of N fertilizer applied. 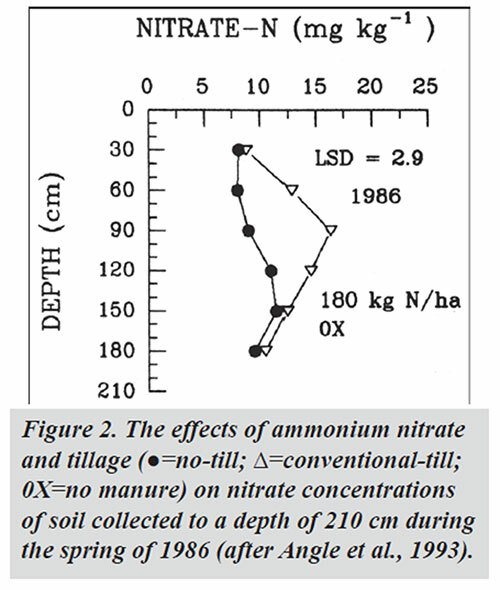 The explanations by the authors of the study include: (i) the lack of a winter cover crop on the conventional till plots affected the soil N content in the root zone and the subsequent rates of nitrate leaching; (ii) the no-till plots had higher rates of denitrification compared to the conventional till plots (i.e., higher populations of denitrifying organisms in no-till); (iii) crops in no-till plots used N more efficiently (removal of more N from soil); and (iv) the conventional till plots had an accumulation of nitrate from the plant residues of previous years. Soil pH generally refers to the degree of soil acidity or alkalinity. Chemically, it is defined as the log10 hydrogen ions (H+) in the soil solution. The pH scale ranges from 0 to 14; a pH of 7 is considered neutral. If pH values are greater than 7, the solution is considered basic or alkaline; if they are below 7, the solution is acidic. It is important to recognize that because the pH scale is in logarithmic units, a change of just a few pH units can induce significant changes in the chemical environment and sensitive biological processes. For example, a soil with pH 5 is 10 or 100 times more acidic than a soil with pH 6 or 7, respectively. Sources of H+ ions in soil solution include carbonic acid produced when carbon dioxide (CO2) from decomposing organic matter, root respiration, and the soil atmosphere is dissolved in the soil water. Other sources of H+ ions are root release, reaction of aluminum ions (Al+3) with water, nitrification of ammonium from fertilizers and organic matter mineralization, reaction of sulfur compounds, rainwater, and acid rain. Certain soils are more resistant to a drop or rise in pH (buffering capacity). Therefore, the lime requirement, which is the quantity of limestone (CaCO3) required to raise the pH of an acid soil to a desired pH, must be determined specifically for each field before amending the soil. Soil pH affects the soil’s physical, chemical, and biological properties and processes, as well as plant growth. 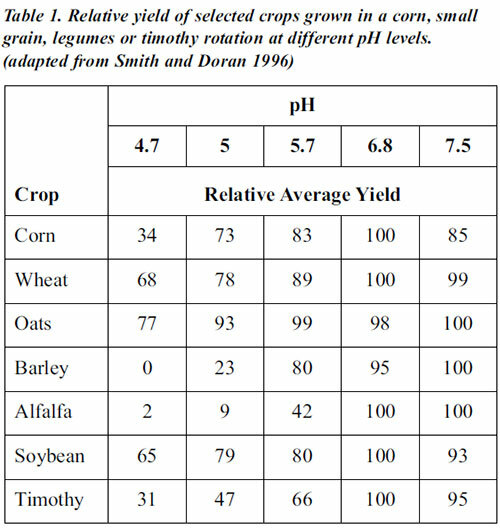 The nutrition, growth, and yields of most crops decrease where pH is low and increase as pH rises to an optimum level (see table 1). Many crops grow best if pH is close to neutral (pH 6 to 7.5) although a few crops prefer acid or alkaline soils. In acid soils, calcium and magnesium, nitrate-nitrogen, phosphorus, boron, and molybdenum are deficient, whereas aluminum and manganese are abundant, sometimes at levels toxic to some plants. Phosphorus, iron, copper, zinc, and boron are frequently deficient in very alkaline soils. Bacterial populations and activity decline at low pH levels, whereas fungi adapt to a large range of pH (acidic and alkaline). 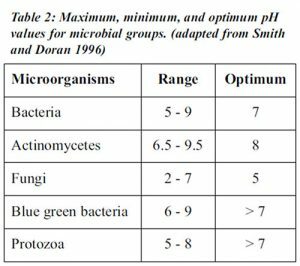 Most microorganisms have an optimum pH range for survival and function (see table 2). At very acid or alkaline pH levels, organic matter mineralization is slowed down or stopped because of poor microbial activity linked to bacteria. Nitrification and nitrogen fixation are also inhibited by low pH. The mobility and degradation of herbicides and insecticides, and the solubility of heavy metals are pH dependent. The effects of soil pH on cation availability influence aggregate stability since multivalent cations, such as calcium ions, act as bridges between organic colloids and clays. Some diseases thrive when the soil is alkaline or acidic. Take-all, which is caused by the fungus Gaeumannomyces graminis, is favored by alkaline pH and infects wheat, barley, rye, and several grasses. Deficiencies of many nutrients, decline of microbial activity and crop yield, and deterioration of environmental conditions are associated with pH levels as discussed in the previous section. Liming, addition of organic residues rich in basic cations, and crop rotation to interrupt the acidifying effect of leguminous crops increase soil pH. Applying ammonium based fertilizers, urea, sulfur/ferrous sulfate, irrigating with acidifying fertilizers, or using acidifying residues (acid moss, pine needles, sawdust) decrease soil pH. Increasing organic matter increases buffering capacity.